Are EVs doomed or going mainstream? The 2014 Volt will arrive at dealerships this month with a sticker of $34,995, including shipping. That drops the effective price to $27,495 after applying the $7,500 federal tax credit. DETROIT -- Doug Fleming, a sales manager at Findlay Chevrolet in Las Vegas, awoke to a text message at 5:50 a.m. one day last week. A customer who recently had bought a Volt forwarded a link to an article about General Motors' decision to chop $5,000 from the price of the upcoming 2014 model. The accompanying message was just three letters long, shorthand for a vulgar phrase essentially asking: "What gives?" It's the same question hanging over the entire electric-vehicle market. Even as Tesla Motors enjoys strong demand and lots of buzz for its Model S luxury electric sedan, prices are cratering in the mainstream EV market. GM's move last week followed similar actions by Nissan, Ford, Daimler, Fiat and other EV makers that have slashed list prices or rolled out cut-rate leases. To EV skeptics, the price erosion offers proof of a dim future for the technology and is an indictment of the federal subsidies propping up consumer demand. But many automakers and advocates looking at the trend see a natural evolution of the EV market -- not unlike what they envisioned nearly three years ago when the Volt and Nissan Leaf debuted to great fanfare -- with prices starting high and declining over time, as with most other breakthrough technologies. The course of EV prices, and how the changes are interpreted, will have big implications for automakers, policymakers, consumers and dealers. By 2019, the U.S. government will have spent $7.5 billion to promote the production and purchase of EVs, according to a Congressional Budget Office estimate. Will the market be fully weaned by then, if the money indeed flows for that long? And will that market reward companies such as GM and Nissan that spent heavily to establish an early foothold, or those that chose to wait until prices settled down -- as an official at Chrysler Group indicated last week that it would? Costs are declining, albeit slowly. GM cited "great strides in reducing costs" as a factor in the price cut for the Volt, which is entering its fourth model year. Each version has had behind-the-scenes nips and tucks to take out costs, such as removing excess circuit boards and sensors. Savings from moving Leaf production to Smyrna, Tenn., from Japan, was a big factor in Nissan's $6,400 price cut early this year, to $29,650, including shipping. Moving production of the expensive lithium ion battery module and the electric motor in-house has saved money, too. Far greater cost savings aren't far off. GM CEO Dan Akerson has said he expects GM engineers to eliminate as much as $10,000 in per-unit costs on the next-generation Volt, scheduled to arrive in late 2015 or early 2016. GM hasn't said how much each Volt costs to build. "People forget that this was brand-new technology," says Jon Bereisa, CEO of consulting firm Auto Lectrification and the systems architect for the Volt during its creation. "Of course the price will fall. The price of your smartphone doesn't go up. It goes down." Price reductions have triggered sharp sales growth. The Leaf's price cut stoked a tripling in sales this year through July, to 11,703 units. The new price -- around $22,000 after a $7,500 federal tax credit -- in effect put the Leaf in the same comparison set with gasoline-powered compact cars. "It does seem to be working toward our ultimate goal, which is to make it the first pure EV for the mass-market buyer," says Nissan spokesman Brian Brockman. Through July, overall, sales of EVs and plug-in hybrids this year are up 138 percent from a year earlier, to 48,889. Still, that's less than 1 percent of the U.S. market. But plug-in sales are hotter than hybrid sales were in their infancy, data from the U.S. Department of Energy show. In the 31 months from the December 2010 launch of the Volt and Leaf, through July, 119,874 EVs and plug-in hybrids were sold in the United States. That's more than twice the number of hybrids sold during their first 30 months on the market more than a decade ago. The 2014 Volt, which will arrive at dealerships this month, has a sticker of $34,995, including an $810 shipping fee. That drops the effective price to $27,495 after applying the $7,500 federal tax credit. Buyers of EVs like them. 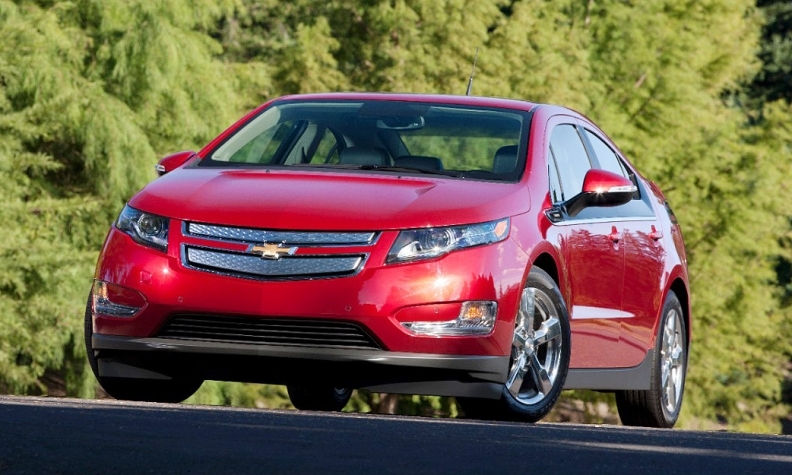 The Volt has topped Consumer Reports' customer satisfaction survey two years running. As prices fall and volumes rise, that means more happy customers spreading the word, helping to buttress marketing campaigns that even the companies concede have failed to adequately explain how the cars work. Chelsea Sexton, a prominent EV advocate, believes customer zeal for the Volt and Leaf have made GM and Nissan more bullish on the technology's future and more willing to absorb losses until cost savings and natural demand take over. "They know that part of the game is not making money in the first few years because they see the market growing," she says. The Volt's price drop last week dented the enthusiasm of some owners. Fleming, the sales manager on the receiving end of the heated text message, says he tried to explain that the new sticker price simply incorporates the incentives GM was putting on the car before. GM has been offering cash rebates of $4,000 on 2013 Volts since June, and $5,000 on 2012 models. "That's not how he sees it," Fleming said of his customer. "He thinks his car got devalued." The price erosion also raises the question of just how long automakers can wait. GM was losing money on Volt sales even before slashing the price. Nissan CEO Carlos Ghosn has said the base Leaf is profitable even at the lower price. Sales volumes "just aren't large enough for economies of scale to be in place yet," says industry analyst Alan Baum. "The battery technology, the supply base, the cost savings -- those all are still in the future. It's a marathon, not a sprint."